By Grange Eye Consultants|2019-01-03T17:48:59+00:00March 13th, 2019|Laser Eye Surgery, Presbyopia, Video FAQs|Comments Off on How long does it take to recover from presbyopic laser eye surgery? By Grange Eye Consultants|2019-01-03T17:46:14+00:00March 6th, 2019|Cataract Surgery, Laser Eye Surgery, Video FAQs|Comments Off on How long does cataract surgery take? By Grange Eye Consultants|2019-01-03T17:44:23+00:00February 27th, 2019|Laser Eye Surgery, Presbyopia, Video FAQs|Comments Off on How does presbyopic LASIK laser blended vision work? By Grange Eye Consultants|2016-03-11T10:27:20+00:00September 8th, 2016|Laser Eye Surgery, Paul Rosen, Video FAQs|Comments Off on What happens if I have an epiretinal membrane? By Grange Eye Consultants|2016-11-04T11:13:24+00:00August 1st, 2016|Laser Eye Surgery, Refractive Lens Exchange, Robert Morris, Video FAQs|Comments Off on Why should I consider refractive lens exchange? By Grange Eye Consultants|2016-03-10T16:44:14+00:00July 28th, 2016|Laser Eye Surgery, Robert Morris, Video FAQs|Comments Off on Can laser eye surgery treat my need for reading glasses or bifocals? Can I go blind from laser eye surgery? 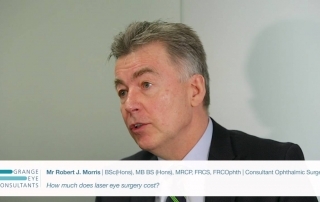 Robert Morris talks about concerns about going blind from laser eye surgery and other risks. By Grange Eye Consultants|2016-03-10T16:42:29+00:00July 25th, 2016|Laser Eye Surgery, Robert Morris, Video FAQs|Comments Off on Can I go blind from laser eye surgery? 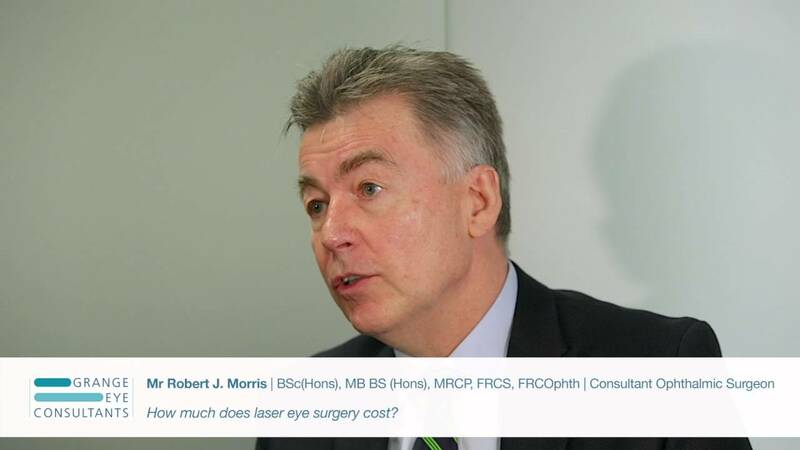 Robert Morris explains the factors behind laser eye surgery cost and why surgeon-led care may cost more than high street chain laser eye surgery. By Grange Eye Consultants|2016-03-10T16:41:06+00:00July 21st, 2016|Laser Eye Surgery, Robert Morris, Video FAQs|Comments Off on How much does laser eye surgery cost? What is a SMILE procedure? Robert Morris explains that the SMILE procedure, developed by Zeiss, has many advantages for certain groups of people. By Grange Eye Consultants|2016-11-04T11:13:24+00:00July 14th, 2016|Laser Eye Surgery, Robert Morris, Video FAQs|Comments Off on What is a SMILE procedure? When can I get back to work after laser eye surgery? By Grange Eye Consultants|2016-11-04T11:13:24+00:00July 11th, 2016|Laser Eye Surgery, Robert Morris, Video FAQs|Comments Off on When can I get back to work after laser eye surgery?